Not a runner but want to be part of Team Brookline? Join Team Brookline as a volunteer! Strengthen our community by sponsoring Team Brookline. Without even lacing up your sneakers, you can support Team Brookline runners and charities. Team Brookline, the Town of Brookline’s official Boston Marathon team, builds community through sport. 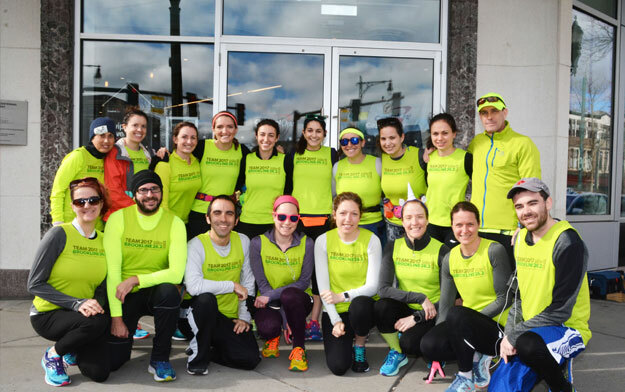 Runners who train and run with Team Brookline strengthen our community, expanding access to mental health care, literacy, the arts, youth development programs and education. Since being established in 2012, more than 150 runners, supported by friends, family, neighbors, colleagues, and each other, as well as our local business community, have raised nearly $1.5 million to make a true impact in the lives of all who live, work, or go to school in Brookline. Calling all runners! Join the 2019 Marathon Team!